Method: A descriptive, cross-sectional, multi-centre study was used to determine the prevalence of malnutrition, whilst a descriptive exploratory design was used to determine the use of nutrition-related quality indicators for the identification and treatment of malnutrition. A total of 141 adult hospitalised patients in three public hospitals in an urban setting participated. Mid-upper arm circumference (MUAC), body mass index (BMI), and malnutrition universal screening tool (MUST) were used to determine the prevalence of malnutrition or malnutrition risk. 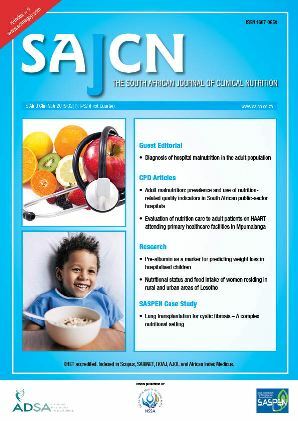 A Hospital Nutrition Review Tool (HNRT) determined the use of nutrition-related quality indicators.